Comes with a tripod and has a great light transmitting coefficient, allowing using it even in dim lighting. The tripod is easy to tip over as the monocular as the gravity center is closer to the front. 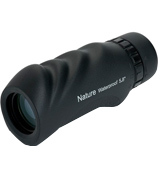 Top-rate monocular, with weather-resistant qualities and a durable body, that shows a bright, crisp picture. 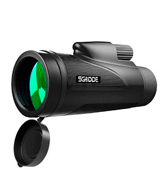 A perfect choice for bird watchers and hunters. 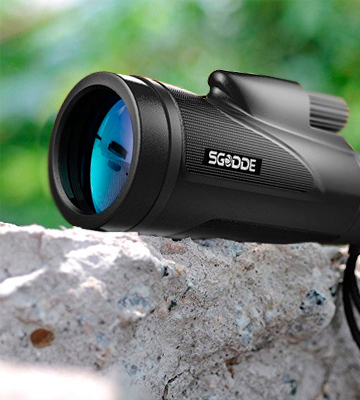 One of the smallest monoculars with a 10x magnification ratio. Low light transmittance, owing to the small eyepiece diameter. 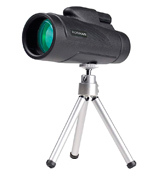 Celestron 71210 is a compact solution for bird watching or sports events. The body has a great grip and waterproof qualities, making it suitable for use under any weather conditions. At a thousand metre range, it will provide you with an exceptional 143-metre field of vision. The model features a low-light-level night vision, meaning that the usual reflective nighttime lights will not impede but rather ensure a clear vision. The housing doesn't have that rubberised surface, so it might slip from wet hands. The SGODDE Super Clear 12x50 is a great overall package. The monocular itself is no slouch but it is the extra accessories that make it such an attractive option for a variety of customers who enjoy sightseeing, large sports events, and open-air concerts. Boasts a far-seeing magnification ratio and great light transmittance ratio, thanks to the fully multi-coated glass. 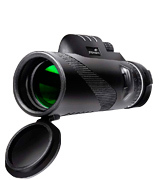 As it features PORRO prism system, this monocular is bulkier and heavier than many other models. The BNISE monocular will become an optimal choice for watching distant objects even under faint lighting conditions, owing to great characteristics, superb magnification ratio, and convenient body design. 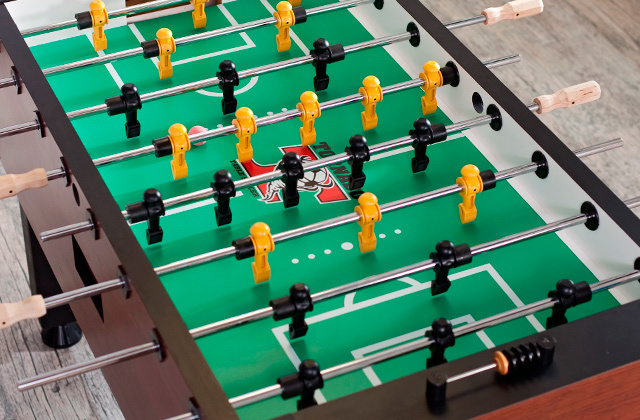 The rubberised surface provides a firm and comfortable grip. As per usual, it also protects the seemingly fragile device from drops. The monocular won't let moisture or dust get in its way. The debris won't be able to get inside the device. The field of view is relatively limited. 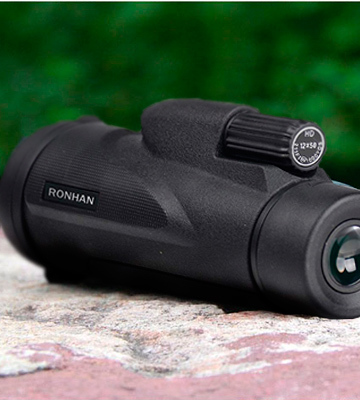 The RONHAN 12x50 is a pretty affordable option with a price tag of a budget monocular and the specs of a solid optical device. It doesn't weigh a whole lot and the model will easily fit into a bag, so you can always bring it with you to your next outing. 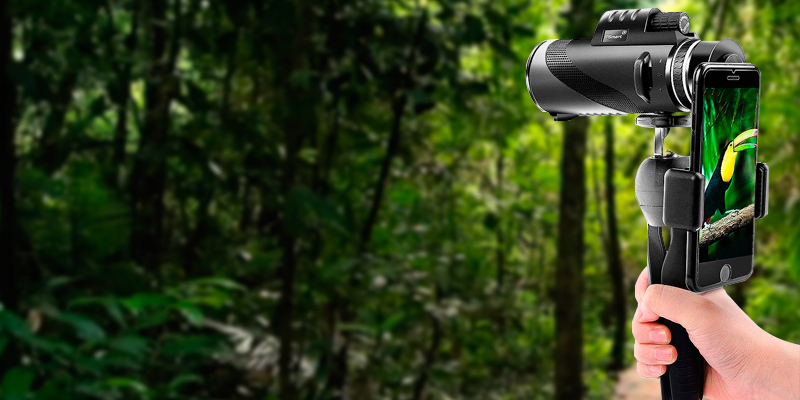 The Polaris Explorer monocular will surely show you the world and all its hidden beauty. When travelling, a lot of tiny but important details slip out of our eyespot merely for the natural limitation of the human sight. 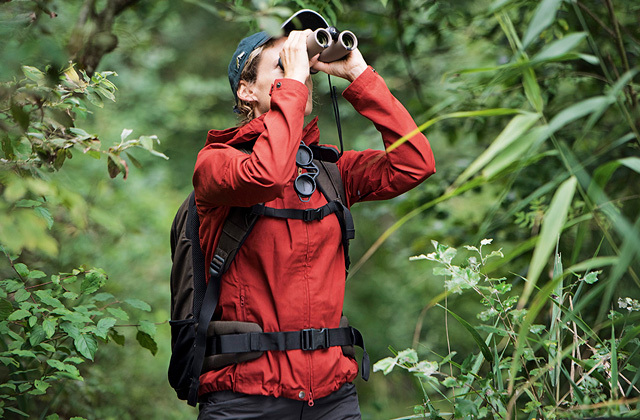 With the Polaris Explorer monocular, you won't miss a spot and discover them anew. 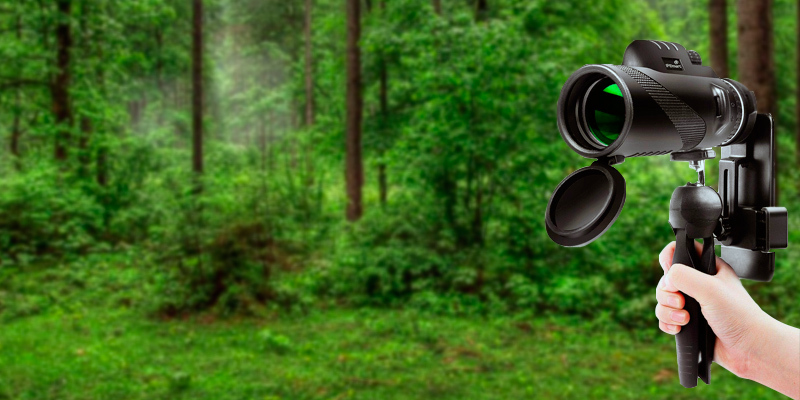 The Polaris Explorer monocular will be of great help for travellers and bird watchers, thanks to its exclusive image specifications and fully multi-coated glass capable of transmitting a great flow of light through it. The monocular boasts 12x magnification power that allows watchers to see clearly the objects 300 m away as if they were located 25 m away from you. 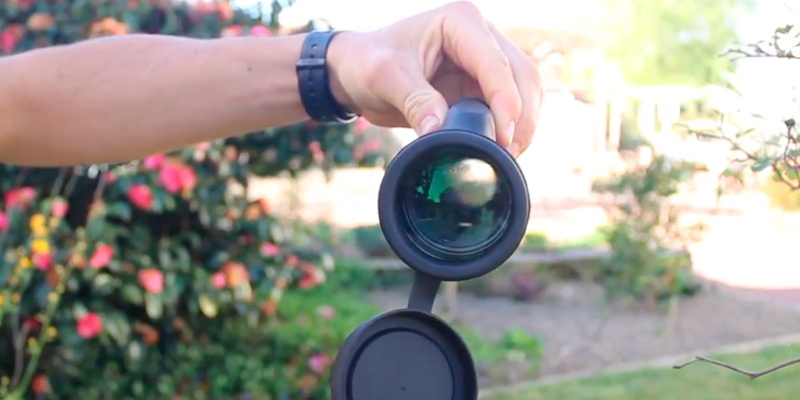 The Polaris Optics has created a sophisticated, yet easy-to-use monocular. It’s fully waterproof, while the interior is filled with gas to prevent fogging of glass from the inside. That means the lens will always stay clear and dry when the temperature changes rapidly, and can be used under the rain. At mere 14 oz. the monocular comfortably lies in a hand. Besides, it also comes with a pouch for transportation and a tripod. 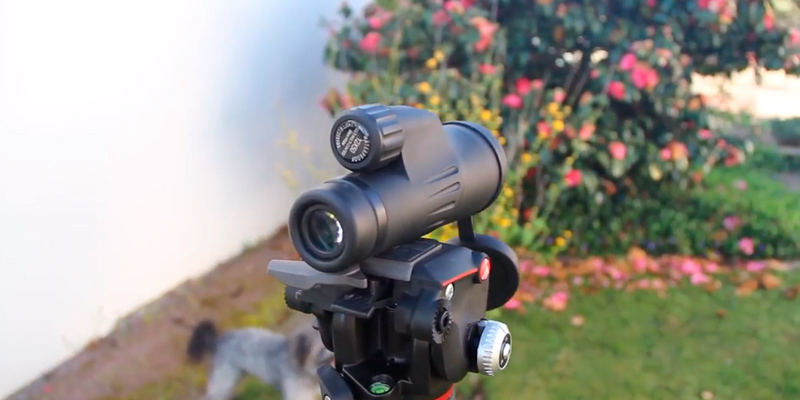 The tripod is an awesome inclusion for those of us, who likes bird watching. For example, when you find a beautiful bird sitting in the nest, just mount the monocular on a tripod, point at it and you can share the view with a friend or just gaze at the bird, without tiring your hand by holding a monocular for a long time. Сelestron company has more than 50 years of experience in the field of optical instruments manufacturing. And, sure, the company has had its hiccups. But, for the most part, they're putting that experience to good use, providing their customers with great optics at an affordable price. 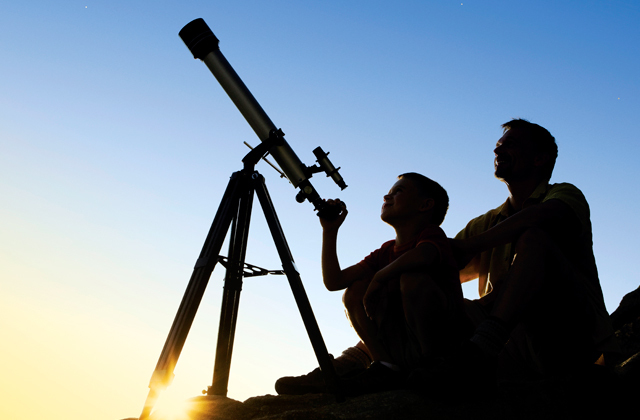 And while this is evident in the majority of their products, we would say that the Celestron 71210 is probably one of the best examples of that. Generally speaking, "attractive" in the most literal sense of the word is not something you associate with optics. But that is the first word that comes to our mind when we look at this device. For a monocular, it is undoubtedly pretty. On top of that, this pretty monocular is very compact and convenient to hold with both hands, mostly thanks to the ergonomic grip. The ergonomic grip is also the part that makes this black model a bit prettier than most of its counterparts. We don't know if the visual appeal is the first thing that the manufacturers had in mind when they were designing the product. But it is definitely an aspect of the model's construction that they had no intention of sacrificing. The sort of ribbed, finlike design makes the monocular look ace. On the outside, the body is covered with rubber for additional protection. 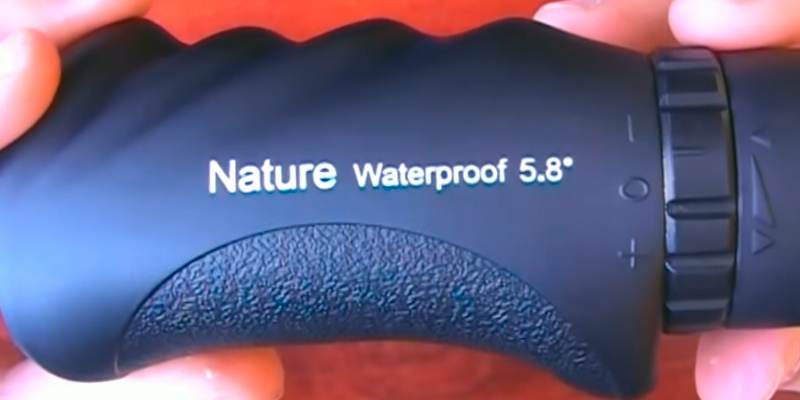 The flat bottom part has a rough texture to prevent the device from slipping out of user's hands seeing it's being used in the rain or seized with sweaty hands. Speaking of the weather, the monocular body is waterproof sealed. This also provides the Celestron 71210 anti-fog qualities under the condition of a rapid temperature change. 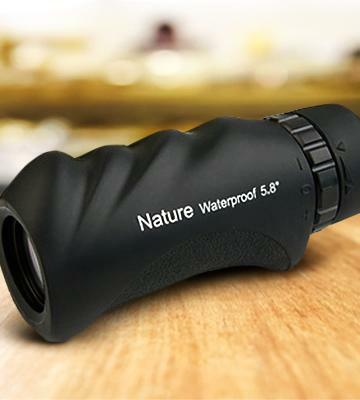 Thus, the monocular can be adapted for hunting or bird watching during rainfall seasons. The optics here also boast a pretty decent quality despite the modest overall size and the smaller glasses of the monocular. The eyepiece makes 2.5mm in diameter, while the objective lens nevertheless makes 25mm for better light transmission and features a multi-coated BaK-4 glass. Additionally, the monocular delivers a tenfold magnification, making it optimal for shooting ranges or watching sports matches as well. Of course, nobody is saying that you can't bring this device with you to some kind of music festival. With that magnification ratio, you'll be able to observe your favourite band from the most ridiculous range. Saving the best for last, we couldn't conclude the review without mentioning that this monocular weighs just 170 grams, so the usual hand fatigue will kick in a lot later than it usually does. For the most part, the thing that we like most about this monocular is just how well-balanced the product is. But it's not like it doesn't have a couple of notable features that help the model stand out in a positive way. At a thousand metre range, it will provide you with an exceptional 143-metre field of vision. With that kind of view, this device is particularly suitable for concerts and ball games as it will cover the entire stadium or a solid open-air venue. Though it isn't like the model won't cut it for your typical monocular applications like bird watching, hunting, hiking, climbing, and just observing wildlife in general. The usual BAK4 prism and multi-coated optical glass lens will make the view considerably brighter and noticeably clearer. Most of the model's specifications do not pain a particularly outstanding picture but we wouldn't say the same about its design and construction. Sure, some things are more or less standard. 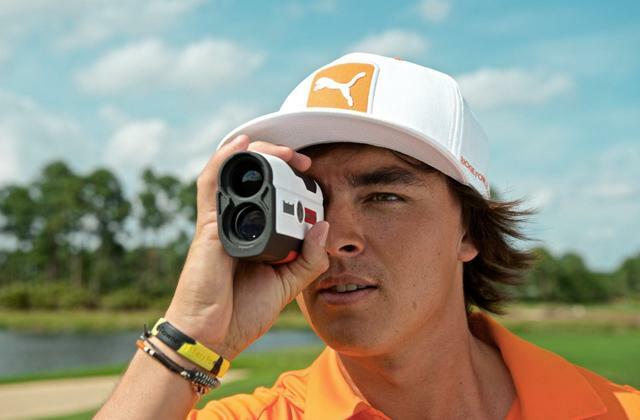 You have your adjustable eyecups that you can easily twist up and down for an optimal view. There's also the centre focus knob that allows you to easily focus that view using just one hand. The model features a low-light-level night vision, meaning that the usual reflective nighttime lights will not impede but rather ensure a clear vision. Though the monocular itself is pretty good, it isn't just the optical device itself that makes the product such a popular and attractive option. 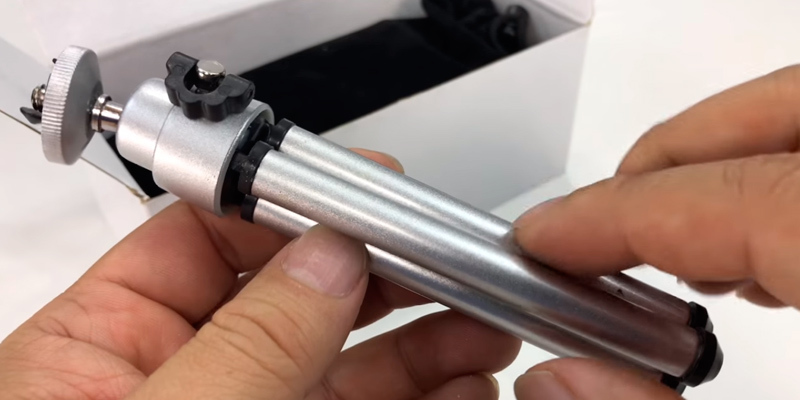 In addition to it, you'll get your standard tripod, a nice accessory that resists shaking and provides you with the opportunity to enjoy a hands-free viewing experience. Of course, there's nothing particularly impressive about a tripod, but the monocular also comes with a universal phone adapter. 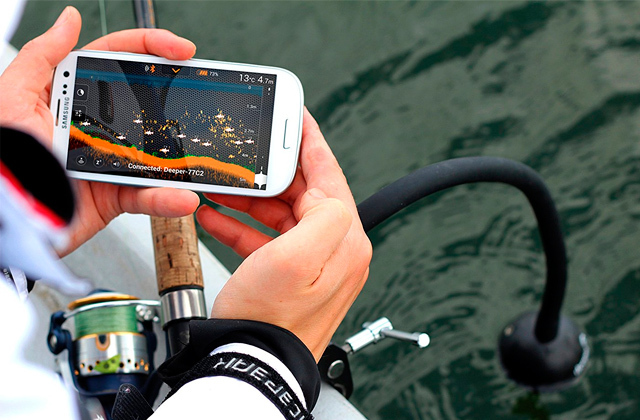 It is compatible with the majority of modern smartphones. The anti-slip construction of the adapter will hold the phone in place firmly and precisely. With its help, you will be able to take great pictures and film the most remarkable wildlife footage. The construction of the model itself, on the other hand, leaves sort of a mixed impression. On one hand, the frame is solid and the usual rubber armour is there, with shock-absorbing qualities that protect the device from drops. But the part of the surface where you usually hold the device isn't rubberised, so it might slip from wet hands. All things considered, the SGODDE Super Clear 12x50 is a great overall package. 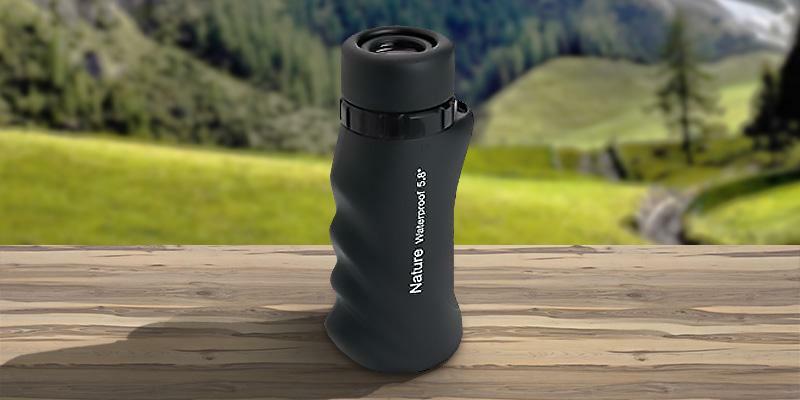 The monocular itself is no slouch but it is the extra accessories that make it such an attractive option for a variety of customers who enjoy sightseeing, large sports events, and open-air concerts. At first glance, the BNISE monocular appears sort of large and a lot more cumbersome than the majority of similar models. And we can't say that the first impression is false here. 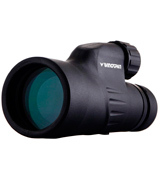 The monocular features precisely 18.3 x 8.9 x 7.6 centimetres in overall dimensions and 450 grams in weight. 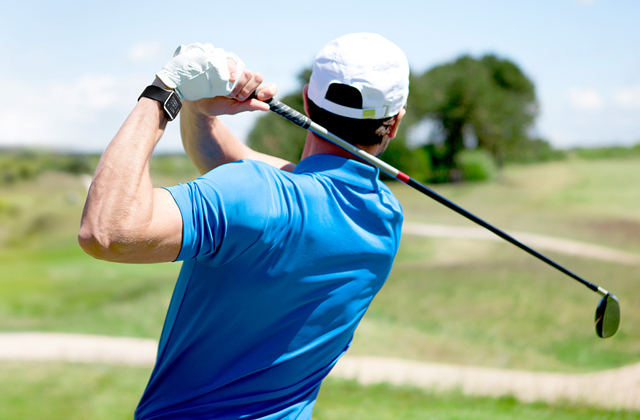 Holding this thing with one hand for an extended period of time will definitely prove to be a bit of a challenge, even for the most physically gifted individuals. And, unlike the said majority of similar monoculars, the device in question comes without a tripod, so you will definitely have to purchase one separately if you intend to use this piece of optical equipment for wildlife observation purposes. Having said all of that, the model still occupies a pretty high spot on our list and it isn't a mistake on our part. 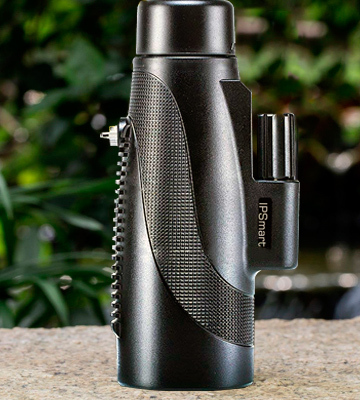 First off, despite the seemingly cumbersome design, the monocular incorporates a particularly practical body, with rugged sides that provide a comfortable and firm grip. Besides, any optical instrument is only as good as its optics and the model absolutely does not trail behind in that category. Generally speaking, you start with the magnification. In this case, a rather spectacular 13x magnification ratio, the kind of ratio that will allow you to observe the smallest details of your objects at very long distances. The image quality is absolutely wonderful. At 50mm objective lens and 5mm ocular lens, it has a comparatively wide angle of view: 108 m at 1000 m away. Additionally, a fully multi-coated glass has a great light transmittance ratio. Therefore, you are provided with a crisp picture even in low light. The scope also has a reticle for measuring the distance between the objects. The only downside is that the PORRO lens systems are not too light and can be somewhat bulky. Going back to the model's construction for just a moment, we would like to briefly talk about its defensive properties. If you're the type who enjoys outdoor recreation, you know full well how fickle the weather can be. Fortunately, it won't be much of an issue here. 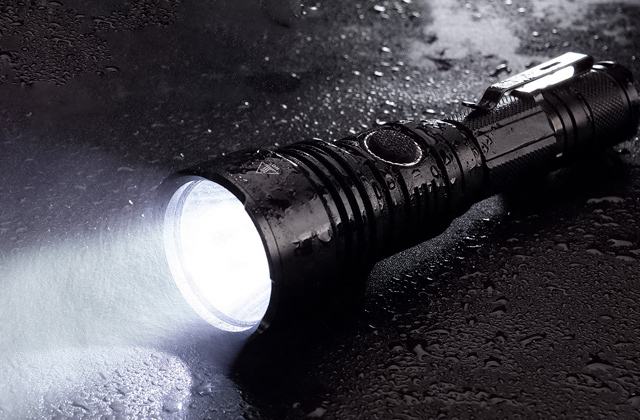 As the model is water- and fog-resistant, it won't fail you even in the dampest environment. Again, the monocular weighs almost half a kilo and is pretty big. However, its advantageous optic specs make it a great choice for customers who are not averted by its dimensions. As for the intended use, this BNISE monocular is great for all of it, from sports events to wildlife observations in any conditions. The RONHAN 12x50 is being advertised as a high-powered monocular. And, honestly, for its price, we can't say that it wouldn't be fair to call it that. When it comes to the performance of any piece of optical equipment, it is usually magnification that's the driving force behind the said performance. And, with this model, the 12x magnification ratio is what separates the device from the majority of similar models in its price range. Add to that the 50 mm of objective lens diameter and you have yourself a budget monocular with more than impressive specs. Both the magnification ratio and the diameter of the lens make this model a great option for your general sightseeing purposes. You can bring it with you on a backpacking trip across the countryside. It isn't a bad hunting option. 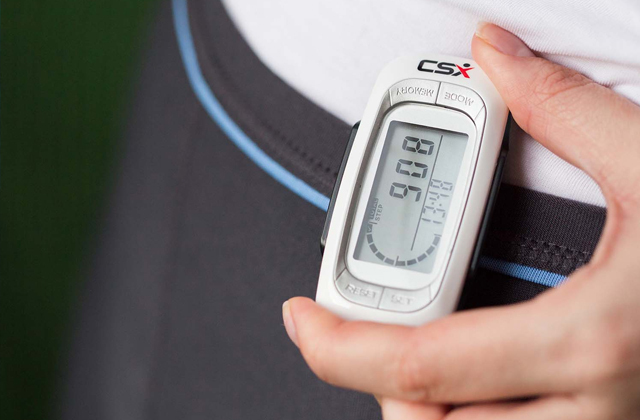 The device will work wonders for climbers. Professional ornithologists will certainly be able to find some use for it and so will the birdwatching enthusiasts. The only real issue we have with this product is the relatively limited field of view. At a thousand metre range, the model won't give you more than 70 metres to work with. It isn't that bad but a field of vision like that might not cut it for large open-air venues and certain sports events. Sure, it will be enough for football stadiums or something similar to it, but we wouldn't recommend it to Formula One enthusiasts. Aside from performance, a lot rests on the shoulders of the monocular's construction and overall design. But can't say that the latter two do a bad job. The large BAK-4 prism and the multi-coated optical glass lens combination will always be able to make the view clean, bright, wide, and just all-in-all pleasant. The rubberised surface provides a firm and comfortable grip. As per usual, it also protects the seemingly fragile device from drops. Aside from sloppiness, it is often the weather that determines the service life of your optics and, unfortunately, not in a good way. But the model doesn't fall victim to most of the weather's shenanigans. It won't let moisture or dust get in the way. The debris won't be able to get inside the device. So, with all that in mind, you can always bring this thing outdoors regardless of the weather conditions. As for the extra accessories, what we have here is more or less your usual package. There's a tripod that will provide you with a fixed vision for an extended period of time. There's also a smartphone adapter, a perfect accessory for people who enjoy taking and sharing pictures. In short, the RONHAN 12x50 is a pretty affordable option with a price tag of a budget monocular and the specs of a solid optical device. It doesn't weigh a whole lot and the model will easily fit into a bag, so take it with you on your next outing. Without a doubt, one of the most popular portable optic devices for looking into the distance is binoculars. The only issue with them is that they are quite big and bulky. The appearance of monoculars on the market helped solve this problem a bit. They share the same working principle, yet have only one ocular (hence the name). Naturally, they are more lightweight and smaller but, unlike spy-glass, their body is not telescopic. And of course, compared to any average binoculars, a monocular is less expensive. In fact, you can acquire two different monoculars for the price of one pair of binoculars. 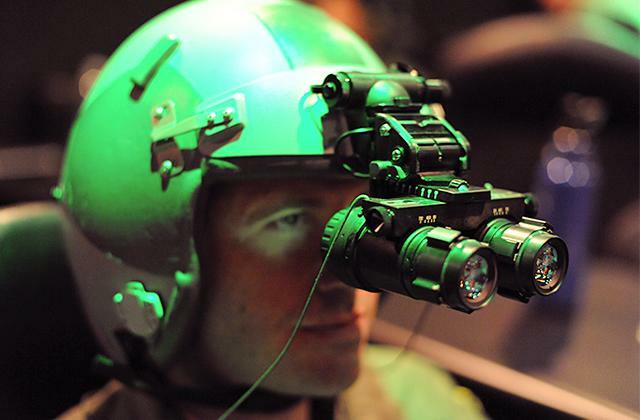 Read also about night vision devices and learn how to choose the right one to suit all your needs. You may also get interested in buying a special bag for carrying your optic devices as well as all other accessories. The last but not least is the glass type. Usually, it's BK-7 or BaK-4. Those refer to a form of an eyeglass lens. In the case of monoculars, Bak-4 is a preferable choice as it gives a slightly better picture than the BK-7 type of glass. The latter has a prism glass in the form of a square, what may create a small chromatic aberration. However, BaK-4 has just a slightly higher refractive index than BK-7, so in both cases, you'll get a great result. Monoculars often come in a body of a tube; therefore they're easy to hold in one hand. 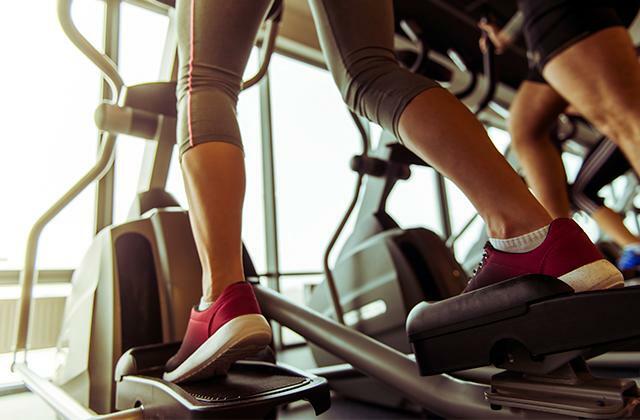 Manufacturers come up with different surface materials and finish for even steadier grip: wavy or knurled, dimpled or pimpled, rubber or plastic, you name it. 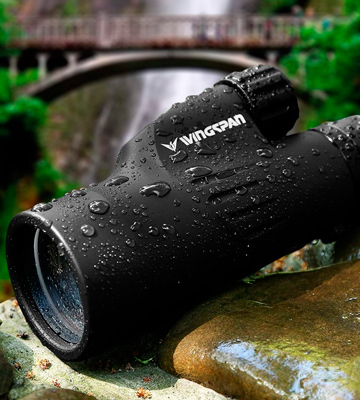 A high-quality monocular should also have waterproof and dirtproof qualities. And in order to protect the inner side of the glass from fogging, special transparent gas is pumped and sealed inside the body. Among other features, there may be adjusting rings with or without dials for better focusing on a target. The size and weight of a monocular are also critical parameters, especially, if you are going to climb up a mountain or go camping. Monoculars are often chosen because they are smaller and lighter than binoculars. 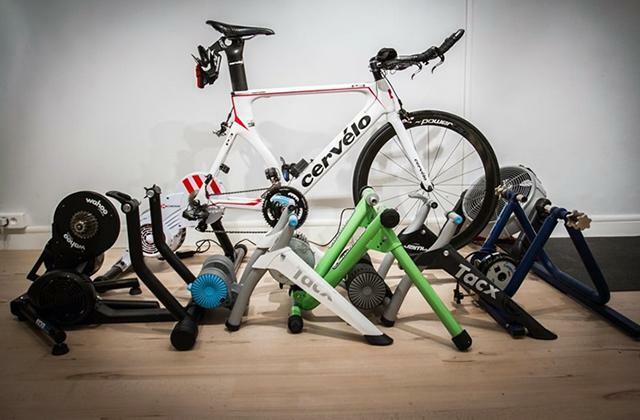 Therefore, look for lightweight, compact models. Monoculars usually come with a case or a carrying pouch for transportation, neck or wrist straps, protection lens caps, a cleaning cloth, etc. 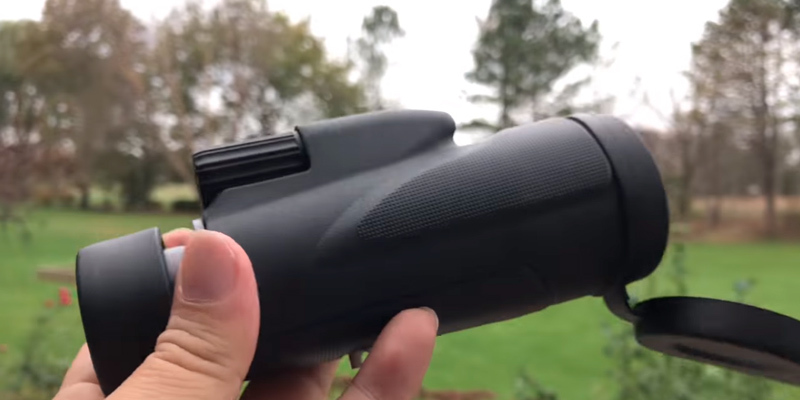 What’s more, the eye lens may have a rangefinder reticle, just like a sniper sights, or even a built-in compass that comes in handy if you like camping or fishing on a boat. 1. OpticsPlanet Guest Expert Everything You Need To Know About Monoculars, Opticsplanet. July 17, 2015. 2. 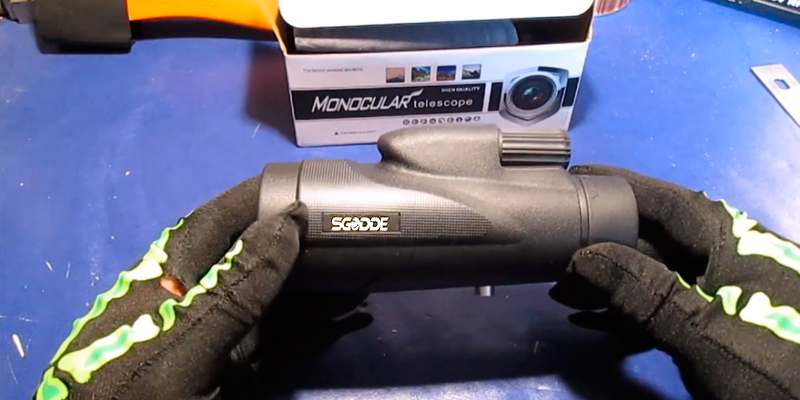 A. Rohlandt How do I Choose the Best Monocular Scope? wiseGeek. June 20, 2016. 3. Eric Lind A Guide to Birding with Binoculars, National Audubon Society. June 15, 2015. 4. Tamia Nelson Focusing on Monoculars, Verloren Hoop Productions. October 9, 2012. 5. 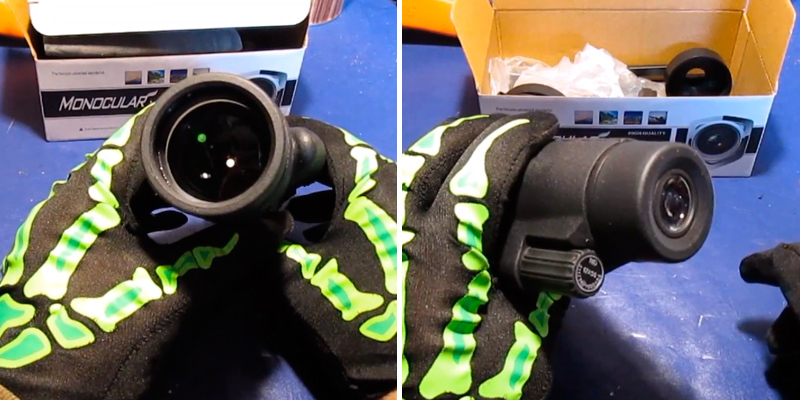 Monocular Buying Guide, eBay, January 27, 2016. 7. How to Choose Binoculars, Ems. 8. Monocular, Wikipedia, June 22, 2016.